Modern apartments, so simple and minimalistic need not only unique interior ideas but also functional solutions. Designers race each other in ideas. Ozeta Studio has found the unusual way, designing a practical bio fireplace X093 Mensola. Nowadays, bio fireplaces are trendy elements in the interiors. Besides the ecological advantages arising from using bioethanol and the technical ones as there is no need to install the chimney-ventilation system, their look is very important. Modern apartments are primarily light and simple interiors, that’s why they need a few expressive details. 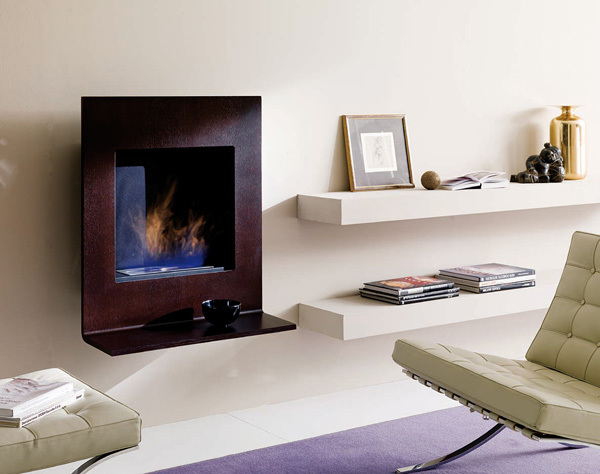 They may include shape or colour but also unique solutions, showing that bio fireplaces are not only a decoration. Italian brand Ozzio Design proves that it is also a functional suggestion, which is the combination of fire and …a shelf. Due to that unusual combination we get the additional space in small interiors, but also the possibility to emphasize the decoration and trinkets in the amazing brightness of fire. At first glance, Mensola looks like a typical bio fireplace. Apart from unique and rare colour it has a practical element too. A shelf which the model is equipped with make a bio fireplace not only a decoration but also an unusual and attractive replenishment of the furniture. On the solid surface of the shelf, depending on our taste, a number of different decorative elements can be placed. They do not have to be heat resistant, because materials that Mensola is made of allow to reduce the warming up of this part to minimum. An additional solution used in this model is carefully designed and the hanging mechanism allows to mount this bio fireplace at any place on the wall. The frame with a built-in shelf is made of wenge coloured oak and the burner is equipped with 750 ml stainless steel tank. Thanks to small sizes and easy mounting, Mensola bio fireplace could be placed wherever in the apartment – in the living room, bedroom or even in the kitchen.